My Taz- passing date June 17, 2007 @ 12:10 pm. at 10 years old. Taz, Thank you for 6 years of joy, love and friendship that easily surpasses that of most humans. Our first fuzzy, the one that started it all, never sick a day in her life who passed quietly in her sleep Tuesday June 19, 2007 at 6 years old. Annie was being treated for ghirardia which overcame her precious little body in spite of every effort by Dr. Brown and her humans, Jack & Angie Light. She left for the Bridge, late on the snowy Saturday night of February 11, 2006. Annie arrived at the rescue after being left behind in an abandoned apartment by her "human" who unbelievably was employed by a veterinarian. Luckily, an employee who worked at the complex, knew Jack and knew his work with rescued ferrets, contacting him immediately. His wife Angie had always wanted a dark eyed white ferret, so little Annie was not at the rescue for too long. 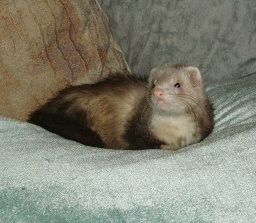 Annie was deaf didn't get along with other ferrets. For some reason they terrified her while she loved Lilly, a 60 pound shepherd mix dog. Jack and Angie catered to her every need and want with a beautiful high rise cage all to herself, covered levels to protect her little paws and , separate play time and lots of turkey baby food…her favorite. She was happy playing by herself, dooking and dancing with joy in the wonderful toys provided to her complete with play boxes hand crafted by Angie. Saturday February 11, Angie called to say that she was concerned about Annie and couldn't get to a vet until Monday. They trudged through a snow storm to pick up some homeopathic remedies I threw together for Annie, hoping to improve her condition until she could get to the vet. They returned home to find Annie taking her last breaths, as she obviously waited to pass until they got home, saying goodbye to the humans she loved so much. Jen Kovacsi and I rushed to be by their side, but Annie had passed by the time we arrived. We shared the loss as if it were one of our own babies, and in reality they are. Once these guys arrive at the rescue, they remain a piece of our heart and soul . We stay in touch with their lives through their adoptive parents for the rest of their life and in passing. Every one touches our heart in a way that is uniquely their own, every one with their own story and personality. Upon returning home Saturday night, I lit a candle to remember our precious Annie. It burned through the night as a reminder of her life, the love and happiness she was fortunate enough to share with Jack and Angie, and her new life that lay ahead of her in the next plane. It's hard to tell what kind of past rescued ferrets come from,…most importantly is the future that lay ahead of them after being rescued and placed with kind and loving humans. It is the best we can do and we must find consolation in knowing that. After being rescued, Annie had two years of love and care before passing on to the Bridge. She had everything a ferret could want,…little consolation to the humans left behind to deal with grief and loss, but the most important thing to remember as we find the strength to move forward to help the next ferret in need. You had the most sparkling little black eyes and beautiful little face, you loved to run and play all by yourself, you were always wiggly and full of energy, we always liked to watch you play and run around the house. We liked to watch you hide and eat your food under your little bed like someone was going to take it from you, and always so cute balled up in your little hammy. It hurt us so when you got sick, we tried our best to make you better, but we didn't succeed. We hope as your Mommy and Daddy that we gave you the best years of your life, we will miss you so much. Now you have made it to the Rainbow Bridge, you will make new friends and meet our old buddies Biscuit and Trisuit and you will never have to be afraid any more. Sweetheart, We love you and are going to miss you-- Err,Err,Err. I remember getting the call from the Humane Society. Someone had found a stray ferret down by the local hospital at the pond. Could I come and pick him up? Sure, I'll be right over. It was a typical December day, cold and wintry. Poor little guy, he must be freezing. Arriving at the Humane Society, I was told that some people had brought him in claiming that he was a stray. Even so, they knew his name, that he had been housed outside, and the street that he lived on. After filling out the paper work, they brought Snickers out to me. A big, beautiful, chocolate sable boy. The name fit him perfectly. His coloring looked just like a snickers candy bar. His head was all fuzzy, he had on his winter coat. I guess he was glad for that, being housed outside and all. Surprisely, he looked in pretty good shape. But I did notice what I thought were scabs on his face, nose and ears.I signed the papers and we were on our way home. I left him out to play, and gave him some good warm food. He was a very good natured boy, probably about 2 years old. I picked him up to get a better look at the scabs on his face. Wait a minute-these aren't scabs, these are deer ticks! 3 layers of them to be exact. All over his beautiful face, his nose, his delicate little ears. I called the vet and took him right in. We picked deer ticks off of that poor soul for over an hour, and still could'nt get them all. So Frontline was applied to to rest. Dr Gividen checked him over, and said that other than the deer ticks, he was in pretty good shape. Watch out for Lyme disease, they told me. Thankfully, that was something that he never got. Home again, and you were settling in. Such a good boy, very happy, and quite lovable. I was hit hard fast. I knew you couldn't stay with me. I had to take you to the shelter. The Christmas meeting was in a week and a half. I was to take you along then and surrender you. That was the deal, Daddy said. As long as you take them to the shelter, you can continue picking them up from the Humane Society. I guess that I had 7 other ferrets at the time, so I didn't push the issue of asking if we could keep you. A week and a half. How was I going to let you go? We bonded more each day. I fell in love with you. The days went by quickly-December 17 came way to fast. I brought you out that morning for your final playtime with Ariana and I. Ariana was just a little girl then. She loved you to. 2 o'clock. It was time to go to the meeting and give you up. How was I going to do this? Such is the life of a rescuer. Daddy was there. He knew how much we loved you. Secretly, he loved you too, But he wasn't going to admit it. Time to go. I put you in the carrier. I said goodbye to Daddy. Ariana was crying, I was crying, but still I headed out the door. Oh, go put him back in his room! What, I said. Go put him back in his room! But no more ferrets!. Daddy was to soft-hearted! Snickers had stolen Daddy's heart too. I was so happy!! Snickers was mine! I still went to the meeting, but my Snicky stayed here at home. Snickers spent 5 wonderful years with me. He would sleep under my side of the bed on an old flannel jacket that I had put there for him. He came out every morning for his a/d and chicken baby food. I loved him dearly. Snickers was never sick until the final few days when he developed congestive heart failure.It was getting hard for him to breathe. He couldn't eat and was having trouble walking. I couldn't let you suffer, so I helped you to the bridge. You took your last breath in my arms. Thank you, Snickers for chosing to spend your life with me. Thank you for the very sweet kiss, just before you left for the bridge. Things won't be the same here without you. You were a very special boy, and I loved you dearly. I look forward to one day meeting you at the bridge. I hope you had your ferret family waiting for you when you crossed over. I love you, Snicky. If tears could have saved you, you would have lived forever. My people just didn't have time for me anymore and it's very important to them that I find a loving home. They are always calling the rescue and checking up on me. I am very sweet, about 4 years old and will give you Lots of kisses......right away!!!! Rest in Peace...or play your little heart out, Annie!!!! Dusty has been fur on bones for two weeks. He came in together with Fairy Buttercup, Vin Diesel Weasel, and Sandy about 3-4 years ago. They all came down with adrenal...as a side note, they are all Marshall Farms ferrets. The rest of the group are doing well on melatonin and herbs. Dusty showed minor improvement before starting to go down hill, he still ate but his body refused to retain any weight. Last saturday I awoke abruptly from a nap to find a puddle of blood on the floor next to the basket where he slept. As weak as he is, he climbed from his basket bed so as not to soil it , not getting anything on him and climbed back into bed with Vin Diesel Weasel at his side. I scooped him up to hold him in what I knew were his last hours. Diesel had been acting strangely all day, not playing, just moping around and pancaking on the floor when he wasn't laying next to Dusty in the basket in the dining room. When I sat down on the sofa with Dusty, Diesel followed us pancaking under the coffee table, staring at me, silently asking if he could join us. I scooped him up as well and the two ferrets laid together the bridges of their faces touching, laying in a heart shape on my lap. A moment so sad, yet so touching with the realization of the bond the two ferrets shared. Diamond the cat bid her farewell by hopping up and perching behind us on the sofa, reaching a lone paw down to touch Dusty's head and say goodbye. The cats love these ferrets. They feel it too. Although I curled him up in a comfy sleep sack, he wriggles out of it just far enough for his face to rest on my chest as if he just had to be touching some part of me. We talked about his life, the rainbow bridge and that it's ok to go, that he'll feel better on the other side, yet still he hangs on. As hard as it is to watch them go, I'm grateful that I'm here for them. I feel the most important thing I can do for my animal companions is to help them cross over. To be here for them in their final hours. No one should pass alone. It must be important to them too as they always call to me if I'm not home to let me know I'm needed. They let me know when their time is coming. An ominous piece of the gift of the ability to communicate with animals without a doubt, but this connection is bound by our love for each other in life......and in passing. It runs full circle as naturally as life itself and I have to remind myself not to curse it sometimes,....to curse the sadness,....not the gift. My Dusty, aka Dustbuster with the most beautiful fangaroos you've ever seen. My Dusty who tagged along on my birthday Gettysburg trip because he just had a tooth pulled and he needed hand feedings. Hilites of the day included a poo in National Cemetery (when guy has to go, a guy has to go....and yes we cleaned it up), sleeping quietly in the sack we used to sneak him into Friendly's where we had lunch. He backpacked along with us through the battlefields enjoying the fresh air and lavishing the attention he got as he was passed from one person to the next. My Dusty who taught Zach at age 7, a valuable lesson in tormenting animals. Zach knew the kind of reaction Dusty had to loud squeak toys, yet he annoyed the ferret anyway . One Saturday, when I was out of the room I heard the squeak toy and Zach laughing hysterically at Dusty's frantic reaction. Dusty reacted by climbing up his leg and biting him hard in the cheek. The bite was not that bad and I didn't coddle him. He cried that Dusty wasn't his friend anymore. I explained to him why Dusty reacted the way he did and that it wasn't his fault. It was a couple of weeks before Zach would accept him as his "friend" again but he learned that it wasn't Dusty's fault. Dusty taught him a valuable lesson in responsibility for our actions and treatment of animals. I shed a tear the day he walked around the corner from the ferret room, Dusty in his arms saying "Look Kim, Dusty's my friend again." He hugged Dusty close and apologized to him. He understood. As I was dealing with Dusty's passing, I found another adrenal kid, one of the rescues, Gizmo, had passed away in his cage. No symptoms of going down hill, just gone. Peaceful crossings sweet babies.